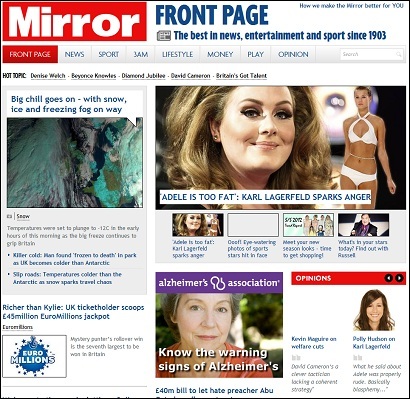 Mirror Online publisher Matt Kelly says in an introductory post that the “cleaner and less cluttered” design will make better use of photography and video. 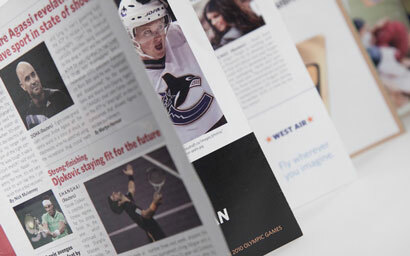 Content is organised into seven sections: News, Sport, 3am, Lifestyle, Money, Play and Opinion. Comments are encouraged on stories, and sharing articles has been made easier. We constantly improve our website and as much as we believe the new look Mirror Online is a big step forward, we know there’ll be things we haven’t got completely right. This entry was posted in Design and graphics, Online Journalism and tagged Design, Mirror, Mirror.co.uk, paidContent on February 8, 2012 by Paul McNally. 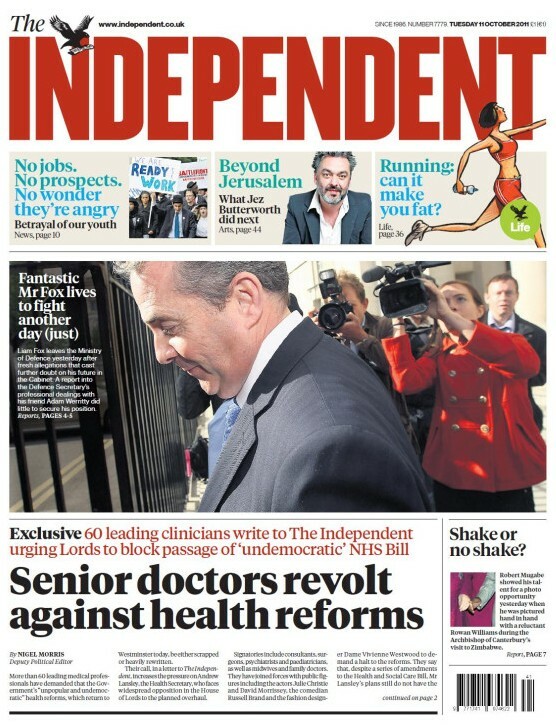 The Indy has a bold new masthead to celebrate its 25th birthday. It certainly sticks out among all the other papers in the shop, which can be no bad thing for the relatively low-circulation title. The new-look paper also comes with a new typeface and headline fonts. The other big change is that the “Viewspaper”, a pullout comment section created by recently-departed editor Simon Kelner, has been ditched. We have decided to use the occasion of the paper’s 25th birthday for a makeover. 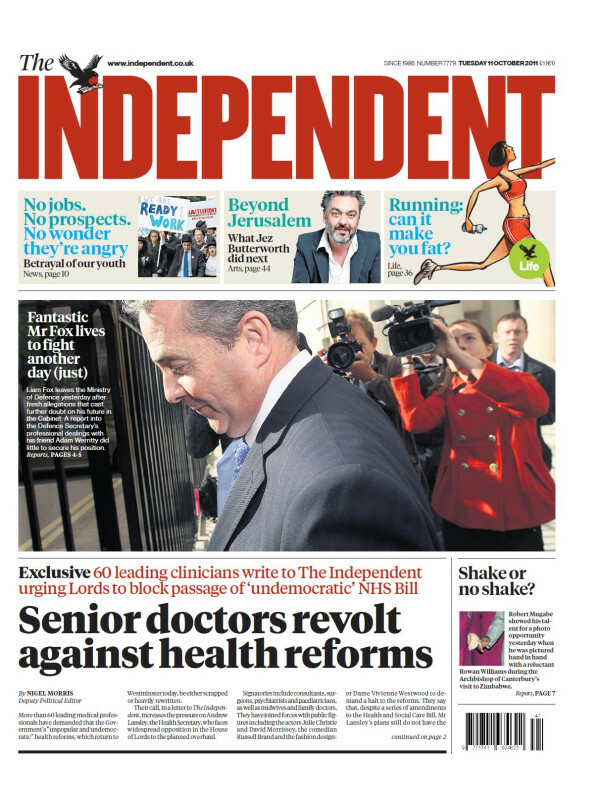 The masthead is bolder – still ‘the Independent’, complete with eagle, but now more striking and harder to miss on the news stands. The body typeface and headline fonts we use have been made more readable. The other, main alteration is that the Viewspaper has gone. We thought long and hard about this. Viewspaper was created to draw attention to the unrivalled quality of the Independent’s commentators. We continue to take pride in this quality. But since taking over three months ago, I’ve become aware that the Viewspaper could be something of a ghetto, to be taken out and read later – but in truth, put on one side and, during a busy day, all too often forgotten. He added that the aim was to create a “faster, more accessible and urgent paper, one that is easily navigated and that puts you in no doubt what The Independent stands for”. This entry was posted in Design and graphics, Newspapers and tagged chris blackhurst, Design, masthead, redesign, the Independent on October 11, 2011 by Joel Gunter. The BBC today launched its newly designed blogs homepage, designed to ease navigation across the site’s almost 300 blogs. Changes include new sections for interesting quotes, a ‘latest on blogs’ feature and ‘my recently viewed’ for greater personalisation. The site is currently in Beta. This entry was posted in Editors' pick, Online Journalism, Social media and blogging and tagged bbc blogs, Design, Internet blog on January 13, 2011 by Rachel Bartlett. For those designing (or redesigning) a news site, this 10,000 Words blog is worth a look. It concentrates on four ‘fixable sins’ of news site design: swamps of share buttons; layers of navigation; avalanches of links; cluttered sidebars. Let’s be honest: In general, news site design isn’t pretty. I know I’m not the first or last to say it, but I do have a theory about why. It starts off innocently enough — an article, navigation, some ads. But as new tools, gadgets, buttons, widgets, extensions and plugins are introduced to the news consumption scene, that once simple design becomes cluttered with bells and whistles that hold the content hostage. Full post at this link. This entry was posted in Design and graphics, Online Journalism, Social media and blogging and tagged 000 words, 10, Design, graphics, Online Journalism, page design on November 23, 2010 by Joel Gunter. Plans for a new sub-editing hub for News Limited’s titles in Australia, part of News Corporation, have been announced. More than 100 sub-editors and designers will move to the centralised production operation. This entry was posted in Editors' pick, Newspapers and tagged Australia, Design, Jobs, production, sub-editing on October 1, 2010 by Laura Oliver. “The tension is unbearable. The office becomes like ‘Lord of the Flies’. We split into tribes and dredge up weaknesses in our colleagues. We speculate. We make lists. It’s our survival mechanism. It’s awful,” writes Sarah Slobin (@sarahslo) who was infographics director at Fortune magazine before being made redundant. Here Slobin describes, in a personal and descriptive piece for an issue of ‘Design’, how ‘nothing stays the same’ when you’re made unemployed. This entry was posted in Editors' pick, Job losses, Jobs, Journalism and tagged Design, director at Fortune magazine, Fortune, infographics director, Lord of the Flies, sarah slobin, snd.org on March 12, 2009 by Judith Townend. “My mind races between sadness, disbelief, anger and a cold, whispering fear that what we are facing as an industry could very well do the rest of us in,” writes Jonathon Berlin. In a visually interesting post, Berlin, who used to be designer and assistant design director at the newspaper, shows his appeciation for the things he learnt there. This entry was posted in Editors' pick, Newspapers and tagged Design, designer and assistant design director, director at the newspaper, Jonathon Berlin, Newspapers, Rocky Mountain News on March 3, 2009 by Judith Townend. “In its 30th annual ‘The Best of Newspaper Design™ Creative Competition,’ the Society for News Design has named four newspapers from Europe and one from Mexico as ‘World’s Best-Designed Newspapers,™” the organisation’s website reports. This entry was posted in Editors' pick, Events, Newspapers and tagged Athens, Berlin, Design, Europe, Expresso, Greece, Mexico, Mexico City, Moscow, Newspapers, Paço de Arcos, Portugal, Russia, snd.org, snd30, society for news design, the News, Welt Am Sonntag on February 19, 2009 by Judith Townend.